Situated between Fort Lauderdale and Miami on the pristine white sand beaches of Sunny Isles, Acqualina Resort & Spa on the Beach is an enchanting Mediterranean villa with an atmosphere that embodies the spirit of luxury, serenity and enjoyment. Guests of Acqualina enjoy luxurious Miami Beach vacations with world-class services and endless opportunity to relax and rejuvenate. Buy a 2 Day Park to Park Ticket & Get 2 More Days FREE! Stay in the heart of the excitement at one of the on-site hotels and experience all that Universal Orlando® Resort has to offer! Play and Explore at LEGOLAND®! Rates starting at $80 per person, per day. LEGOLAND® Florida is a 150-acre interactive theme park dedicated to families with children between the ages of 2 and 12. Receive the 5th night free in Orlando, Florida! 5 nights from $352 The Buena Vista Palace is a paradise conveniently located inside the Walt Disney World® Resort. Stay 5 Nights, Pay for 4 at Fontainebleau Miami Beach: 5 Nights from Only $648 Including Car Rental Fronting the Atlantic Ocean, Fontainebleau resort features four towers comprising 1,504 spacious guestrooms and suites. Sunsational Savings in Orlando, Florida! 6 Nights From Only $729! Come discover the magical surroundings at Walt Disney World Swan and Walt Disney World Dolphin. Adventures by Disney® recently earned the distinction of being ranked the No.1 tour and safari operator for families by the readers of Travel + Leisure magazine. Adventures by Disney received a staggering 99 point ranking out of 100, making it the clear leader in family travel, while also ranking among the top tour operators overall. On the same survey, Disney Cruise Line® upheld its esteemed position as the leader in family cruising, with readers ranking it as the No. 1 large-ship cruise line for families. The rankings also honored Disney's Animal Kingdom Lodge at the Walt Disney World® Resort, with readers ranking it as the No. 1 family hotel email your trip request and we will help you get started! Explore the Best of Florida! Whether it be highly decorated pools & places of relaxation, to working fisherman wharfs and mega mansions, Florida can provide many sights and scenes for your observation! Looking for animals of interest? How about dolphins which love to play alongside boats, large alligators lounging in the water, pelicans, and geckos, there are several common species to be seen and loved in the natural environments of Florida! Be sure to embark on adventure on many yacht cruises, fan boats through the everglades, and many activities amongst many beaches. Whether east coast or west, tourist attractions or scenic touring, call us today to book your amazing getaway to Florida! A brand new theme park, several important new museums, international airport & special anniversary celebrations are developments awaiting Florida visitors, with new features from new zip lines & roller coasters to new hotels, museums & attractions. Oil no longer is fouling the Gulf Coast, and visitors are returning in droves to Florida’s beaches. In Pensacola, one of the sites most affected by the oil spill, the outlook is also rosy. “Everything’s good to go,” said Laura Lee of the Pensacola Convention and Visitor Bureau. “The beaches are beautiful, spring break is selling out.” Fishing boats are back in operation and the area has several new hotels. ORLANDO: 11 galleries featuring the art of Louis Comfort Tiffany opened Feb. 19 in a large new wing at the Charles Hosmer Morse Museum of American Art in Winter Park. Included are leaded-glass windows, Tiffany lamps, the Daffodil Terrace from Laurenton Hall, and other works. 407-645-5311, www.morsemuseum.org. A new permanent exhibit at the Orlando Science Center, Our Planet, Our Universe, http://www.osc.org/. Splash Island Water Park, has opened at the TradeWinds Island Grand hotel on St. Petersburg Beach. The inflatable floating playground, anchored 60 feet offshore in the Gulf, as well as hotel guests for the same price: $16 for one hour, $21.50 for two hours. www.justletgo.com/Waterpark.aspx. ST. PETERSBURG: $36-million building provides more than double the space of the old Salvador Dali Museum. The inside with a wave of glass paneling called the “glass enigma” that shifts in color refracted by sunlight. Inside is the biggest collection of Dali’s work in the world. www.salvadordalimuseum.org. TAMPA: Museum of Art, shows artist Edgar Degas will be on view through June 19. The exhibit includes a selection of his bronze sculptures as well as paintings and drawings. http://www.tampamuseum.org/. World Dragon Boat Racing Championship will take place in Tampa Bay Aug. 1-7, the first time this event has been held in the United States in almost a decade. www.visittampabay.com. FORT MYERS: Prince Albert II of Monaco, a five-time Olympian in the bobsleigh, helped open the new Art of the Olympians Museum and Gallery March 5. The museum showcases Olympic athletes with two galleries, one for their works of art, the other for their sports. www.artoftheolympians.com. SPACE COAST: launches of the space shuttle are on tap at Kennedy Space Center. A June 28 launch of the Atlantis is government approval pending. Other launches include Juno, a solar-powered craft, going up Aug. 5 to orbit Jupiter’s poles; Falcon 9, possible successor to the shuttles, July 15; ULA Delta II Heavy is being sent to the moon on a scientific mission Sept. 8; a new Mars rover launches Nov. 25 to assess whether that planet ever was — or is today — able to support microbial life and habitability. www.spacecoastlaunches.com. FLORIDA KEYS: Overseas Railway links the Florida Keys & mainland – on over 100 miles into open water, and was wrecked by the 1935 hurricane. The present roadway was built over its right of way. A new exhibit at the Key West Museum of Art and History comemmorates the centennial anniversary of the Railway with exhibits that include a recreated railcar, scale replica of the Seven-Mile Bridge, model train expo and vintage footage of the rail journey. www.flaglerkeys100.com or www.fla-keys.com/keywest. The Peabody Orlando has opened a $450-million, 32-story tower with 750 rooms, three pools and other facilities, giving the hotel a total of 1,641 rooms. Margaritaville Beach Hotel in Pensacola, opened last year, now features live entertainment nightly. www.margaritavillehotel.com. Boutique Hotel Viridian with 30 rooms and 10 villas will open later this year on Highway 30-A in Seagrove, in the Panhandle. www.hotelviridian.com. A loft Jacksonville-Tapestry Park, LEED-certified as a green hotel, opened in January with 137 rooms. www.aloftjacksonvilletapestrypark.com. Silver Palms Inn, a 50-room boutique hotel, has opened in Old Town Key West. www.silverpalmsinn.com. New in Cape Coral is the 19-story Resort at Marina Village at Tarpon Point Marina, with 263 units. www.marinavillageresort.com. Planning travel to Florida? Be sure to check out the new re-invented/re-designed Miami – as downtown is reinventing itself with hotels, restaurants, top chef eateries, condos, hotels, a top cruise port, and art destination. If you have shied away from Miami due to their international airport’s reputation of long lines, chaotic security checkpoints, and long concourse walks, fret no more! Lines are more organized, renovated concourses with a “skytrain” shuttle. In 2012, the airport is also expected to have a train which connects downtown Miami and the Airport! LOOKING FOR A PLACE TO LAY YOUR HEAD? A New hotel to the forefront is the JW Marriott Marquis with a white marble lobby and simplistic design, rooms boasting floor to ceiling windows looking out at the Biscayne Bay, also TVs on the bathroom mirrors, indoor basketball court (both played on by guests and professionals). Thinking of a trip to the JW? Winter rates start around $450 per night. Next hotel on the list includes a RockResort known as Tempo Miami, with contemporary designed rooms and suites, which is housed in the condo tower of the American Airlines Arena – also home of the Miami Heat. Tempomiami.rockresorts.com. Another hit the EPICHotel offers soothing neutral palette rooms of beige white and brown, happy hour for wine consumers and a spa even boasting a fertility counseling opportunity! Inside the EPIC hotel is ZUMA a sought after Japanese tapas restaurant. Epichotel.com. The W South Beach Hotel & Residences offers a three bedroom suite for a mere $5,000 per night, a popular option. Outside get your exercise and sun at the basketball court and long pool with cabanas! The former mansion of Gianni Versace also offers a fun place to stay with intricate mosaics, fabrics, gold plated bathroom fixtures which has been restored to perfection. BEACH SCENE: Paula DaSilva – the finalist of Hell’s kitchen chefs delicious entrees at the Eden Roc Renaissance Resort. Nextdoor, the Fontainbleau Miami Beach Nightclub and Arkadia are a popular destination. 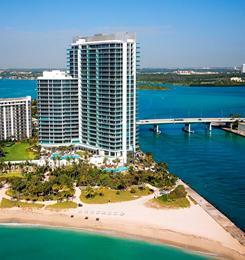 Further south of Miami Beach offers smaller hotels along with stylish pricey accommodations and luxury hotels. LOOKING FOR GLAMOROUS ARTWORK? Look no further than the Wynwood Walls which houses a collection of murals by graffiti artists and others – located in the warehouse district near downtown. The second Saturday night each month is a popular gallery stroll. While her, grab a bit to eat at the Wynwood Kitchen and Bar!